I love the name of this service. 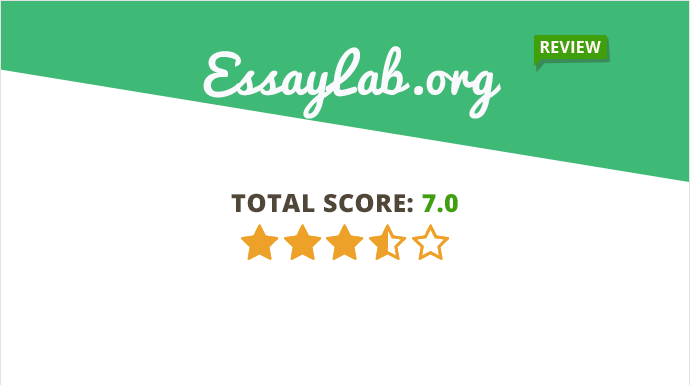 Essay lab sounds right; like a lab that creates content for struggling students. I don’t get the website design, though. It’s too plain, and there’s way more content than you want to read when in a hurry to order a paper. The paper I got was bad, to say the least. The sentences were too simplistic and there were too many grammar mistakes. I didn’t expect this from a serious writing service. This is a relatively new writing service, so there’s not much of a reputation to talk about. The website doesn’t look cool. The company tries too hard to convince you to order papers, but the text on the pages is too long and no one really reads it. These are the main types of papers the service delivers: book report, essay paper, dissertation, PowerPoint presentation, lab report, research paper, term paper, thesis paper, admission essay, and more. So, this is a suitable website for high-school, college, and university students in terms of service versatility. The guarantees are solid: money back guarantee, 24/7 customer service, timely delivery, 100% original papers, financial guarantees, and full confidentiality. There is a claim for free revisions, but you won’t find more information about that policy. In fact, the whole terms and conditions part is missing from this website. That’s the first sign that something is very wrong with Essay Lab. There’s a problem with the deadlines; they are not specific. The longest deadline is 15+ days, so that leaves the writer with a lot of space for late deliveries without any consequences. The shortest deadline of 3-23 hours is very broad, so you can’t be sure you’ll get that paper overnight. The prices for academic writing services start from $16.50 and they go up to $44.20 per page. Don’t expect to get any discounts at EssayLab.com. The quality of the paper was low. There were problems with the spacing and grammar. The paper seemed like it was written by a mediocre elementary student, although I asked for College Senior quality. When I asked for revisions, the service returned a cleaner version of the paper. The grammar errors were fixed, but this still seemed like an elementary-level paper. The customer service was pretty decent. The representatives were always available and they did their best to handle the issue. It was the writer I had problems with. Since there are no terms and conditions at the website, my revision rights were not clear, so I only got proofreading when I asked for detailed changes in the document. Plagiarism report, outlines. There are no extra features at this website. You get the standard service with no discount and no special treatment. That would be okay if you got high quality in return, but (according to my experience) this team doesn’t have what it takes. In conclusion, I would recommend checking other websites before ordering papers online. The problem with the deadlines is very serious. I chose the option 7-8 days and I got the paper on the 9th day. The low quality was only an addition to the bad impression I had. Do you have any experience with EssayLab? Feel free to share!